Alaska Airlines invites you to enter The Incredible Adventure Sweepstakes for a chance to win an incredible family adventure. 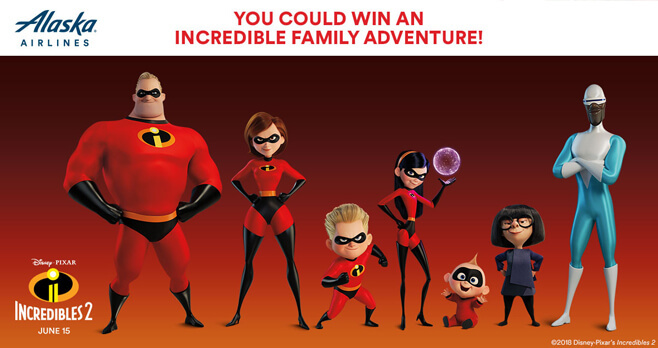 Enter daily through June 3rd and you could win one of two exciting family getaways inspired by Disney Pixar’s Incredibles 2.
Who Can Enter? If you are an individual legal resident of the 50 United States or the District of Columbia, and are at least 18 years of age and the age of majority in his/her jurisdiction of residence, you are eligible to enter the Alaska Airlines The Incredible Adventure Sweepstakes. When To Enter? Sweepstakes runs from May 14, 2018 at 9:00 AM PT until June 3, 2018 at 11:59 PM PT. What Is The Sweepstakes Prize? The Grand Prize consists of either a trip to attend the world premiere of Disney Pixar’s Incredibles 2 or to enjoy the Pixar Pier on its official opening day at Disney California Adventure Park. Who Are The Sweepstakes Winners? Individuals may request the names of winners by sending a self-addressed, stamped envelope by August 2, 2018 to: Alaska Airlines The Incredible Adventure Sweepstakes, P.O. Box 251328, West Bloomfield, MI 48325. I have never been on a cruise. This would be a wonderful first-time trip.